The experimental cooking this weekend yielded some sumptuous recipes. This bite size wonder will be my favorite for a long time to come. Take a non stick pan with some oil, saute the mushroom caps and stems till brown on high heat separately- in batches. Be careful not to tamper the shape of the caps when sauteeing. I add this step to remove the raw musky smell of mushrooms. Once done, take them out and cool. In the same pan, add a tsp of oil-- sautee onions, jalapenos , carrots and chopped sauteed stems on high heat. Add chilli powder, herbs and salt to taste. The mixture browns and comes together. Remove from heat and let it cool. Take the cooled caps and stuff them with the now cooled mixture, top with some parmesan cheese. Preheat oven at 350 and set your timer to 5 mins. 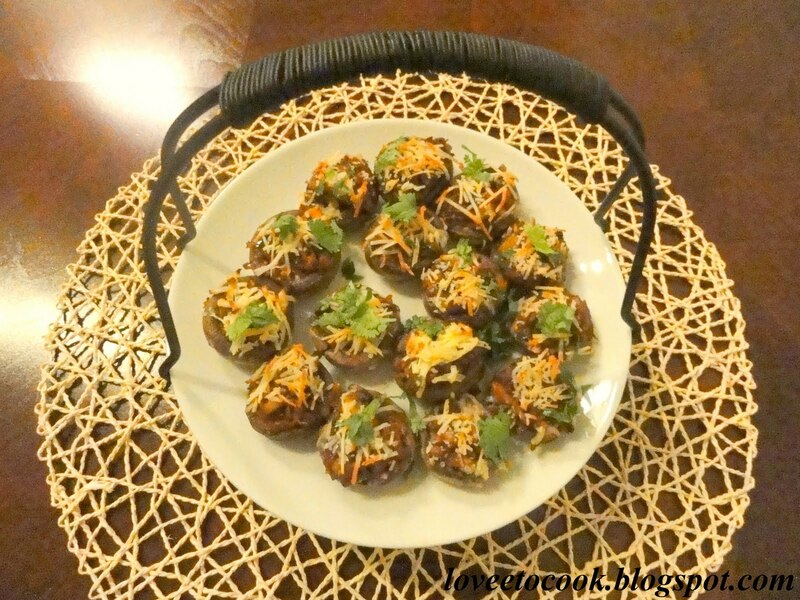 Place the stuffed mushrooms and turn to broil after 5 mins for another minute or two. Serve hot with a garnish of cilantro and lemon juice. Truly appetising!! Tip: Never add salt when when sauteeing on high or the mushrooms will sweat and go soggy.